Guys, can we talk about gauge for a minute? 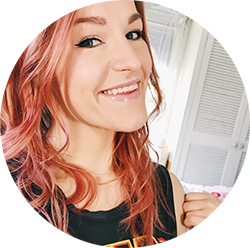 I mean, it's going to be more than a minute given that the title of this post says this post is about gauge, but I had no idea how much help it can be when you're trying to figure out a project! Whether you're trying to create something yourself or you just want to modify an existing pattern, gauge is going to be an absolute lifesaver. Gauge is essentially the amount of rows and stitches you get per inch of your knitting. Now, keep in mind that everyone knits differently. Some people are loose knitters, some people are tight knitters. Heck, you could be a loose knitter one day and a tight knitter the next! It can change and it's different for everyone. Pretty much any yarn you buy is going to give you the gauge of the yarn. Let's take a look at the picture above and go left to right. First, you're going to see that the yarn weight is 3 (light). This will also be a determining factor in your gauge. Bulkier yarn or lighter yarn is going to make a giant difference in the way your piece knits. Obviously, you can probably guess that a lighter yarn is going to give you more rows and stitches per inch, and bulkier yarn is going to give you less rows and stitches per inch. Next on the label is the gauge. You'll see that there are two different squares: one has knitting needles and one has a crochet hook. I'm sure you can guess that the one with knitting needles is what you should look at if you're knitting and the one with a crochet hook is what you should look at if you're crocheting. You'll also notice on the inside of the square, there are indications of what size needles/hook they are using to calculate this gauge. Along the sides of each square are numbers. Along the top is the measurement of the square in centimeters, on the left is the measurement in inches, on the bottom is the number of stitches and on the right is the number of rows. So, let's take a look at the knitting square. In a 4x4 inch square, you are going to get 30 rows and 22.5 stitches. If you want to find out how much that is per inch, all you have to do is divide those numbers by four. So, you will get 7.5 rows and 5.6 stitches per inch if you use size 6 needles. Easy, right? Why Should I Use Gauge? Let's talk about the picture above. Those are two baby blankets that I worked on for two of my friends that are expecting this winter. I made the peach blanket on the left first and wanted to come up with my own pattern. It wasn't anything difficult by any means; I just wanted to make some stripes. I found some measurements on Pinterest (which ended up being WAY too big) and decided to map out my pattern in inches because trying to figure out rows just seemed like too much work for me. Well, that backfired on me. When you're making a blanket of any kind, it eventually is going to start getting heavy so that when you lay it out to measure how much work you've done, it's entirely possible that your work is going to stretch. I would measure my work, work several more rows, and when I would measure again somehow I would have less inches done than I did the last time I measured. I've mentioned before how I didn't have the greatest knitting teacher this spring when my Mom and I got back into knitting. I wasn't told anything about gauge and how to figure it out or how to modify it so in my mind, inches seemed like the way to go. But after that whole experience, I realized that I needed to do something different. One of the other big things I needed to factor in was my needle size. I accidentally grabbed size 10 needles so my stitch ended up being looser, which I was fine with since I think a looser knit benefits a baby blanket. On the yellow blanket, I was able to measure my gauge on the peach blanket so I could figure out the gauge and map out a better pattern. This worked great and I had absolutely no issues with miscounting anything or worrying about stretching. This was a million times less stressful than working in inches. How Do I Use Gauge? Using gauge to your advantage is crazy simple, but might need a little extra work on your part. Let's take my above example for instance. If I knew I wanted to use bigger needles than recommended for a piece, all I need to do is knit up a quick square and measure. You can knit a 4x4 inch square quickly and it will save you a ton of headache down the line. Also, so you can get an idea, let's look at the above two pictures. On the left, you'll see the baby blanket we were talking about already. You'll see that the stitches look a heck of a lot looser than the blanket on the right, right? Granted, these are two different stitches (on the left is just knitting, which is garter stitch; and on the right is knitting on the "right side" and purling on the "wrong side", which is called stockinette stitch), but there is a huge difference in the tightness of the knitting. That is because I'm using the needle size that is recommended for the yarn on the right. Also, with the project I'm working on on the right, I modified this from a pattern that is calling for size 2 needles and a yarn weight of 5. I'm using size 8 needles and a yarn weight of 4. This was one of my biggest projects with figuring out gauge and I did cheat a little bit because I found a site that will do all of the math for you! It's meant for a sweater but you can certainly use it for anything. The top portion of the page is helping you find the gauge and that's all you really need! So, anyway, once you find your gauge then you can get to work on figuring out how go about your project. For the yellow blanket, I found that I could knit 8 rows per inch. I wanted my blanket to be around 40 inches long and have some stripes. I was able to do some math and figure out how I wanted to map out my stripes in order to fit it into the length I wanted. I ended up going with my first stripe being 10 inches, and then alternating between 3 inch and 6 inch stripes five times before knitting another 10 inch stripe to end up being 41 inches. As far as width goes, I'm going to point you in the direction of this video, which teaches you how to do the long tail cast on which has become my favorite. It looks pretty and, while it looks tricky initially, it's really easy once you get it down. Plus all you need to do is measure how wide you want the blanket to be instead of counting on your stitches. It makes casting on so much easier! I will say the only downside with knitting by rows as opposed to knitting in inches is that you need to keep track of your rows (obviously). I've just been using hashmarks in a notebook which is definitely sufficient enough. There are counters you can buy or you can keep track on your phone, but for me hashmarks work just fine. And that is my lesson on gauge! I'm still a beginner knitter myself but I've definitely been learning a lot. Knitting has become one of my absolute favorite things to do and it's something that I find time for every day. It's relaxing and there is something so satisfying about watching something you're making materialize before your eyes! Are you a knitter or are you looking to become one? Let me know what you've been learning along your knitting journey! 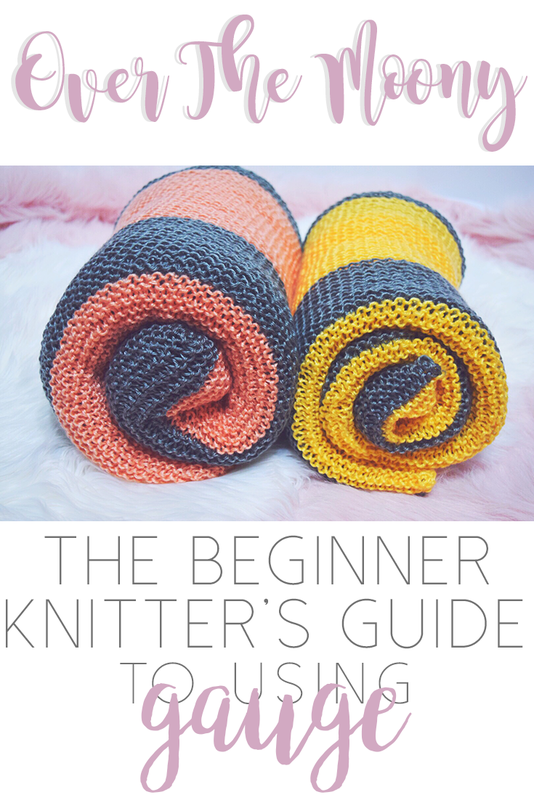 Share this with one of your knitting friends and let me know if you're interested in more beginner knitting posts! I'm more than happy to share things that I learn on my way to being an expert - which is a long way off!